Take a closer look ‘Merica. This is our brand new American Flag Mini Bike. You like the red, white and blue? So do we. And that’s why we created this bike. You don’t hide on this bike. You use your 80cc engine to kick dirt around and take names! Those aren’t decals on the fender. We hand water dip our patterns directly onto the unit. So go ahead and order it. But be prepared for all the neighborhood kids to stand and salute as you ride by. As they should. Great customer service and resolution!! Thank you! Hello Christina and thank you for those kinds words! Monster Moto appreciates our customers! Love it. 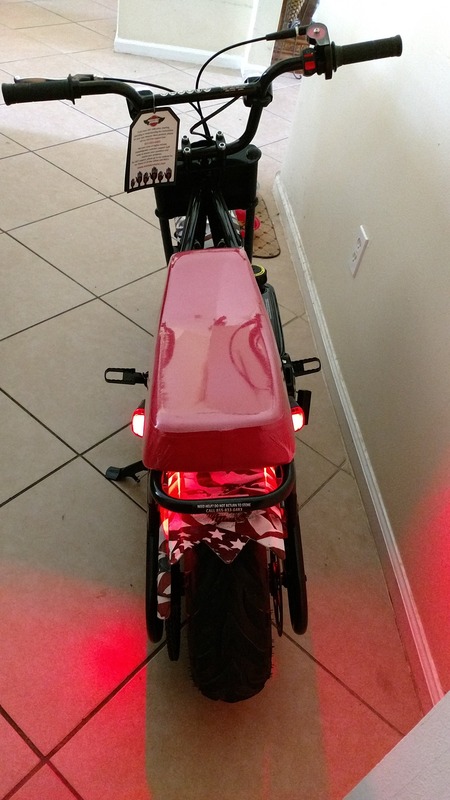 I use it daily, night lights, strobes and turning signals for front and back for every day or evening use. 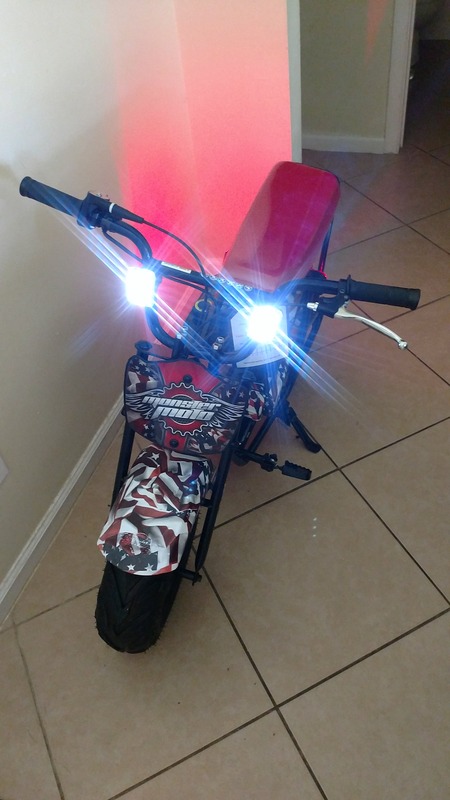 Hello Lloyd, thank you for sharing your modifications with us here at Monster Moto! We love them! So cool! I did receive the wrong bike. I ordered the american flag mini and got the black. Customer service was helpful and gave me the refund I requested. I was not too upset as it is the same bike just wrong color. Very fun little toy! Tanner said: Best Thing I’ve Ever Bought! I'm 21 years old 140 pounds and this thing is the best thing I've ever bought. It pulls me just fine. I love taking this thing on the back trails at my cabin, here in beautiful Michigan! Armand Ceniza said: Kids Love them! Kids love these things! Bought a pair for my twins, the only downside to it is that my other kids want them now too. Did have some issues with UPS, and MonsterMoto went above and beyond to help rectify the issue even though it wasn’t their fault. Saved my twins’ birthday!!! 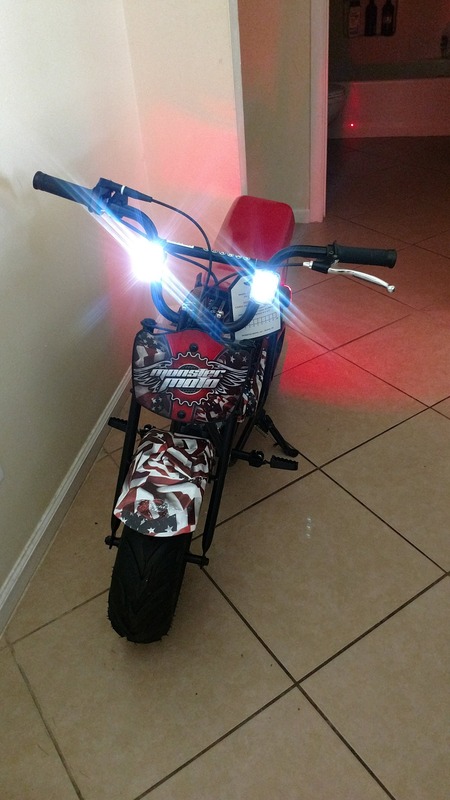 We got our son the American Flag mini bike for his 12th Birthday and he absolutely loves it. We go riding everyday and he can't get enough of it. Easy to ride, great for kids and adults. Great on street and the dirt. Now all the kids want one so we will definitely purchasing another one soon. Incredible bike perfect speed for interested riders.